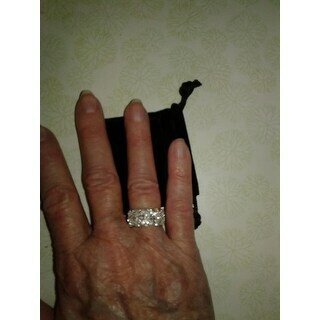 This ring Looks great and fits perfect, everyone that sees this ring on my hand says how beautiful it is and thinks it is real. 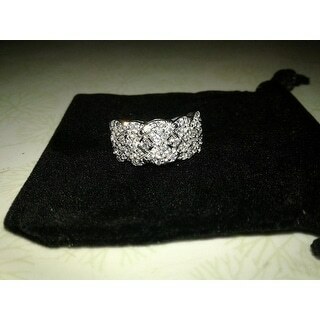 I wear it everyday and it holds up to what ever you put it through and still looks just as beautiful. It is now going on three years since I got it. You will not be disappointed in this one! 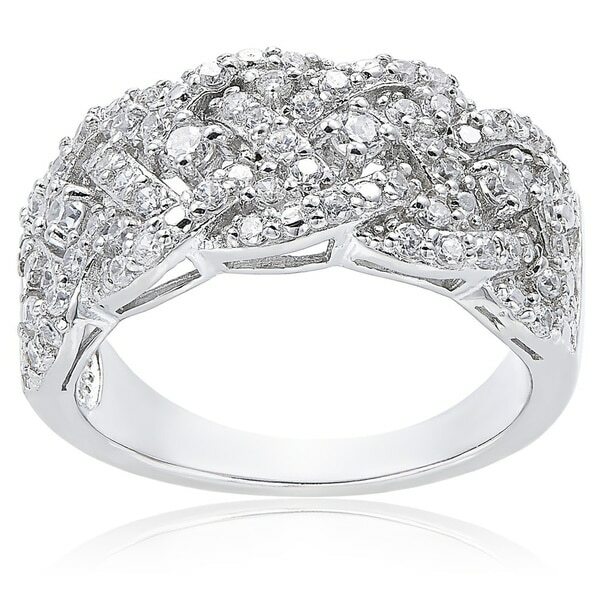 Enjoy sparkle and elegance with this brilliant braided ring. Woven strands of filigree, encrusted with glittering cubic zirconia, create a sophisticated look, while shimmering cubic zirconia accents fill in the spaces between the open framework. With a high polish finish, the ring lends brilliance to any outfit. It's beautiful for cubic zirconia, I love it!! 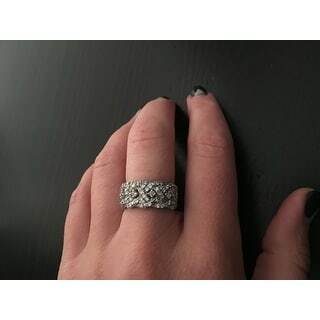 A Very lovely band ring with lots of sparkling cz's that look like expensive diamonds. Very believable, not too bold, but not skimpy either. The width measures 10mm until it tapers very comfortably underneath your finger. I love the low profile for days when you want a glamourous low profile ring. My size 5 fit my size 5 finger perfectly, so I would suggest ordering true to size on this one. **If you plan to wear this as a wedding band together with an engagement ring, order a size up so they'll both fit on your finger. And btw, what a wedding band this would be! 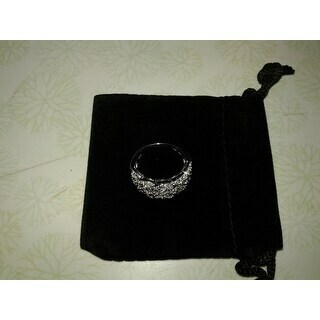 ** I recommend this ring as a wedding ring, anniversary ring, a middle finger ring, or a right hand ring. The braided design is feminine & romantic. To me, it looks like Celtic love knots made of many small sparkling perfect diamonds. It's very comfortable, and it looks like it cost a fortune. ~ Enjoy! Beautiful ring. Cannot tell it is Cubic Zirconia. I get many compliments. 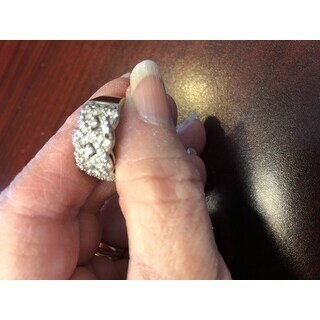 I love this ring and have received numerous compliments especially when I wear it between two narrow cubic bands. Most people have assumed it is a wedding band. The Cubics are brilliant though small and I like the width and heft of the band. This is one of the first rings I reach for when I go out. Gorgeous and it stacks well! I used this beautifully braided band to go with my wedding ring and engagement ring...................it stacks beautifully! Great sparkle too! Got my ring today. Nothing more can be said. 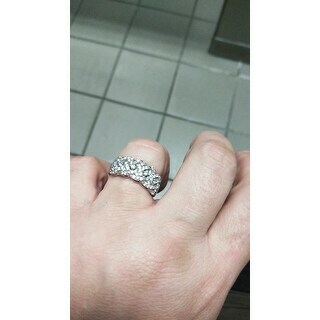 It is a very pretty, sparkly band ring. No sense in fooling yourself. This is cubic. However, it serves a basic service it lights up the day. I am not going to work with this ring on. The silver makes the ring stand out and for the $. I paid for it. I could never complain. This is a beautiful babble and it shines more than any of my diamonds. Nice Job and Thank You. If you like beautiful costume jewelry then this is the ring for you. Being braided sterling silver makes this ring rather unique and distinctive. I don't like this ring! They only had it in gold left in my size. It looks terrible! Might look better in silver! It's beautiful and fits just right. It was great for the price. Very comfortable then a week later my finger turned black from it. Don't buy it. I liked the ring, but it came with a stone missing, so I am returning it. Would not recommend. Ring is very uncomfortable. It is a pretty ring just is uncomfortable. Very pretty and the price was crazy cheap...would recomend this product! Very nice. Looks like an expensive ring!! Had this now for a few months and it still sparkles like new. Very happy with this purchase. "What is the name of the company to write about a replacement? (Missing stones) I need someone's help. DH"
"My ring lost 2 of the CZs and I'm heartbroken. How do I get a replacement? DH"
I'm so sorry! I have the same ring in gold plated. So far I haven't had any problems. Have you contacted the company to see about a replacement or a refund? I have not had any problems with this beautiful ring. You net to contact the company that makes it. So sorry! "Is this ring Rhodium plated?" Not sure, but it is a beautiful ring & I were it every day. It seems to be wearing quite well. I do believe it's platted. "How's the quality on this product? It looks great and the reviews seem to also support the look, but does it feel more like plastic, or is it true to the silver/gold feel?" This BEAUTIFUL ring looks better on your finger than the picture even. It is comfortable and just GORGEOUS! I recommend it to anyone! I have this ring in gold, and I love it . So I am going to try it in silver. Cubic zirconia jewelry strikes just the right note, falling somewhere between expensive gemstone jewelry and cheaper costume jewelry that might be fine for driving carpool but isn't going to cut it when you're heading out to a big event. As you start to invest in cubic zirconia pieces, it's important to care for them in a way that protects both the jewels and the settings. Here are some tips to help you keep your cubic zirconia jewelry sparkling and beautiful. FAQs about Cubic Zirconia Jewelry from Overstock.com. Our guides provide customers with answers to frequently asked questions about cubic zirconia jewelry. AAA Cubic Zirconia Buying Guide from Overstock.com. When you buy an AAA-rated cubic zirconia, you can feel confident that your jewelry will shine for years to come.